We are all aware of "Daddy Long Legs" flying around in the late summer months, being chased by the cat and dog with children finding fun pulling the legs off the fly like insects! What you may not be aware of is the devastating effect the larvae of the insects can have - literally stripping a lawn bare! Do not under estimate them! Leatherjackets are the Larvae of the Crane Fly or Daddy Long Legs, as they are more commonly known. The fully grown Larvae are typically up to 4 cm in length. Patches of dead or dying grass similar to the feeding action of Chafer Beetle Larvae are visual evidence of commonly known. They are legless dirty grey or brown grubs that live in the soil just beneath the grass and merrily eat away at the grass roots and grass stems. an infestation of Leatherjackets. No grass root growth = poor stressed turf grasses and ultimately bare areas. When a pest problem is suspected, the turf should be examined thoroughly to find the culprit. Pests are often found first in stressed areas, such as the edges of lawns or in shady or wet areas. They are not usually distributed evenly so it is advisable to look for spots that have discoloured, stunted or distorted turf. Insects tend to proceed outward from a central point; therefore they are generally most active on the outside edge. What do the adults look like? The long legs give the adult their name of Daddy Long Legs. The adults can lay up to 300 eggs each and invasion of emerging adults from their final Pupae stage is common in the UK. The adults are most active at night and can easily jettison away from predators. 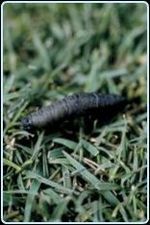 There is little or no benefit renovating and repairing any damage to your lawn until you have killed the Larvae. As Leatherjackets live in the soil for one year only they are easily controlled with an approved Insecticide application which will control them via the fumitory, ingestion and contact action of the control product. It is common for the Larvae to work their way to the surface of the lawn following application. They can be sucked or swept up. Leatherjackets live for one year unlike the Larvae of Chafer Beetles that live for 3 years in the soil. Leatherjackets live in the area of soil just below the turf grass root zone. Get your garden or pen knife out and dig below the surface to locate some, preferably in an area that adjoins an area where the birds have been pecking. If present in the soil, you will easily discover the Larvae just below the surface of the grass. Our Team has counted up to 200 Larvae per single square metre! The eggs are laid in the soil by the young adult Crane Flies in the early autumn, living for only a few days before the cat gets them! The traditional peak egg laying period is the second week of September but the prevailing weather conditions may change this slightly. The eggs hatch after only two or three weeks and the Larvae soon commence their feeding during the winter months onwards. Control them by applying an insecticide based on an active ingredients of Chlorpyrifos or Imidacloprid as soon as you have performed a positive identification, usually in the period October through to the late spring or early summer months, dependant upon the soil moisture and soil temperature in the early spring. Prevention is always better than cure so once one application has been performed; repeat annually if repeated outbreaks are common particularly in light sandy soil areas. The control product will not control any eggs so do not be tempted to apply the control product too early in September before the adults have laid their eggs and these have actually hatched in the soil. The Larvae feed on the roots of grasses during the early spring to summer months. They cause yellow/brown patches and, as the grasses are eaten off at the same level, it may well be that a complete carpet of turf can be removed in tact. There are usually less numerous and less troublesome than Chafer Beetle Larvae but their presence is usually seen the first time the lawn gets stressed by cold, drought or by the frenzied activity of large birds like Crows, Rooks and Magpies. The net result of an infestation – no grass roots, or grass stems, no lawn and a lot of ripped up areas once the birds have gone!